A review of suckling calf implants (Economic Advantages to Implanting Nursing Calves, May 2009), from Oklahoma State University, concluded implants approved in breeding heifers have little or no effect on subsequent reproduction when administered according to the label which in general is from 30-45 days of age and prior to weaning. Less is known for implants approved for stocker cattle but not intended for breeding purposes. Depending on replacement rate and market price for feeder or pregnant heifers, it may be advantageous to implant yearling stocker heifers provided replacement needs can be met and enhanced gain is realized. Therefore, the following study was conducted. 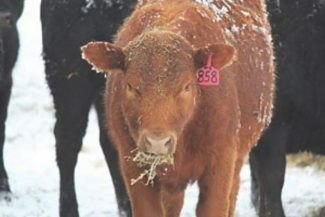 Crossbred beef heifers (n = 3,242), approximately 12 months of age, were managed at 3 locations in the Nebraska Sandhills and randomly assigned to be implanted (40 mg of trenbolone acetate plus 8 mg estradiol, Revalor G), while the control group did not receive an implant. Heifers (525 lb) grazed native Sandhills range for the duration of the trial (164 d). Eighty-two days following trial initiation, heifers were synchronized for estrus and AI followed with clean-up bulls as part of a 25-day breeding season. Body weight was measured at the beginning and end of trial. Pregnancy detection occurred 45 days following bull removal at the conclusion of the summer grazing period. Implanted heifers gained more (+ .09 lb/d) and were 15 lb heavier at the end of the trial (approximately 1.5 lb/d gain and weighed 750 lb). However, pregnancy rate was greater for control (64%) compared with implanted (46%) heifers. Implanted heifers also had a lower pregnancy rate in their second breeding season (93 vs. 96%).